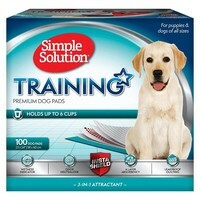 Simple Solutions Puppy Training Pads are super absorbent, locking in moisture and protecting your floor. Simple Solutions Puppy Training Pads are ideal for extended stays alone in the house, toilet training, when travelling, in hotels, or in the car. Also ideal for incontinence or when any dog is ill.